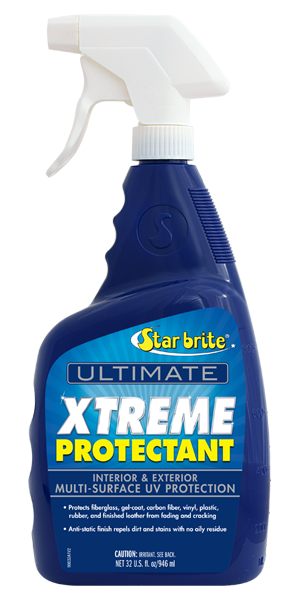 Star brite® Ultimate Xtreme Protectant is formulated to create a barrier against UV exposure and weather. It can also be used as a waterless detailer to remove water spots, dust and light dirt. Helps block UV rays that cause fading & drying. Anti-static finish dries clear & tack-free, enhances shine, and helps repel dust. Made in USA. Satisfaction guaranteed! For best results, apply to surfaces that are cool to the touch and clean. If surface needs to be cleaned, use Star brite® Ultimate Xtreme Clean as Step 1. Spray Ultimate Xtreme Protectant directly onto surface to be treated or spray it onto a microfiber cloth to apply in tight areas to avoid overspray. Work in small sections, spread in circular, overlapping motion. Wipe up any excess material with a dry towel or microfiber cloth. Ultimate Xtreme Protectant works great on top of waxes and polishes to extend service life. Use as often as needed to maintain UV protection on all exterior or interior surfaces.